On Wednesday, a statement from the University Hospitals of Leicester NHS Trust came detailing the case of the first baby in the United Kingdom who survived being born with its hear outside its body. This is something quite particular, not every child has the opportunity even to be born when it’s suffering from the congenital condition called ectopia cordis. When doctors realized that the girl was coming with the organ outside her body, they decided that Vanellope Hope Wilkins – named after the Disney princess – had to be delivered several weeks premature. 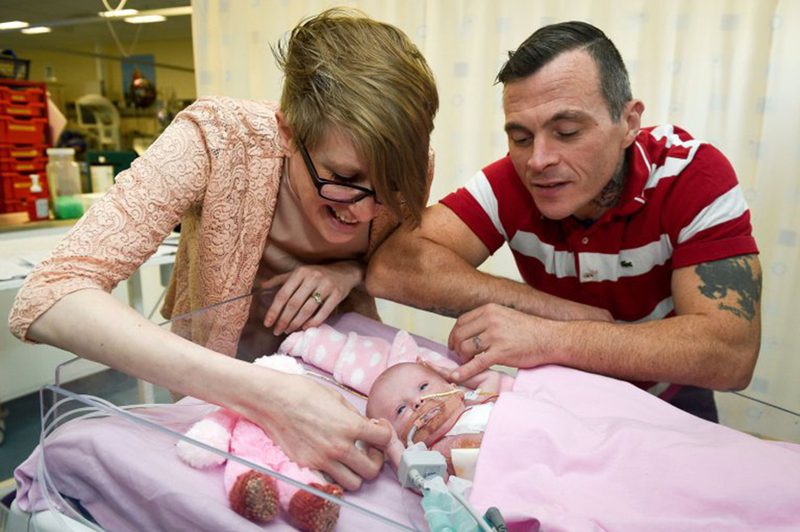 Vanellope is the first baby in the UK who survives being born with ectopia cordis. This same year, on November 22, the mother underwent Cesarean section, and the baby was immediately put in sterile plastic to protect her heart. The most interesting thing is that the organ, although it was not in the place where it was supposed to, was still beating. The daughter of Dean Wilkins, 43, and Naomi Findlay, 31, had to pass through three different surgeries to put her heart inside her chest and, at least, have a tiny possibility to live. Fortunately, the team of 50 doctors did a great job, and now the three-week-old baby girl is resting and recovering in her house at Bulwell, Nottinghamshire. Some experts – including the consultant cardiologist – said they have not seen or known about another baby who survives after being born with this condition. 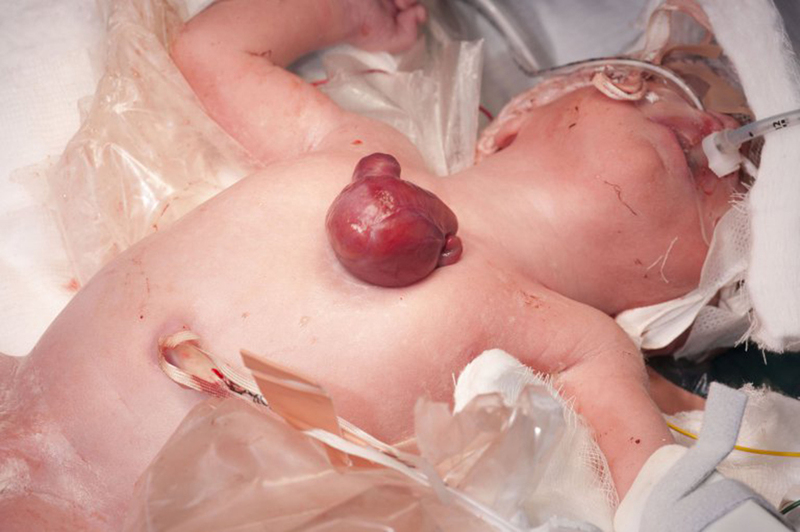 The majority of babies diagnosed with ectopia cordis born already death. Those who make it tend to die in the next few hours. Doctors at first advised the parents “termination” was their only option. However, they decided to leave the childbirth naturally and to stay vigilant throughout all the pregnancy. The mother of Vanellope said she “burst into tears” when doctors informed her about her daughter’s condition. When she and her husband did the research, they both couldn’t “physically look it” due to all the problems the ectopia cordis causes. When the day of the childbirth arrived, they were told that the first 10 minutes were crucial because she would show her ability to breathe. At the moment she came out, Findlay said she felt “relief” when she heard the baby girl crying. 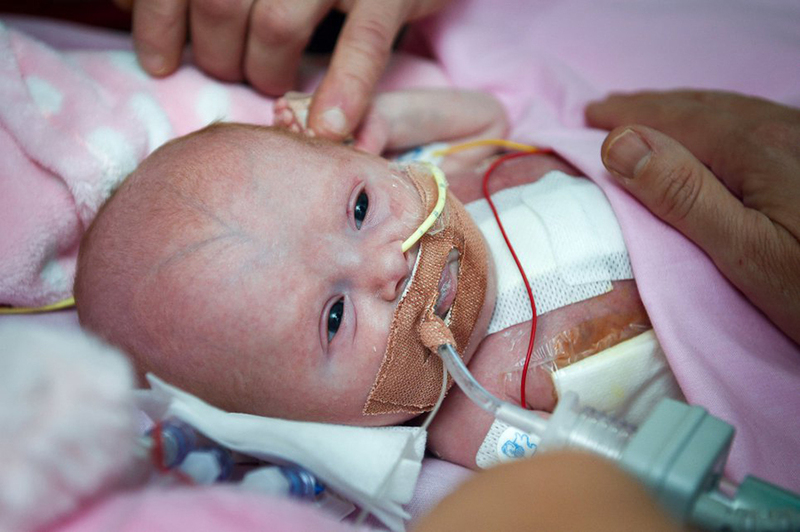 “At around 50 minutes of age, it was felt that Vanellope was stable enough to be transferred back to the main theatre, where she had been born, to the waiting anaesthetists, congenital heart disease and paediatric surgical teams who began the task of putting her entire heart back inside her chest,” said consultant neonatologist, Jonathan Cusack. Doctors had to take the baby girl to the pediatric intensive care unit after she was born. In here, she stayed for several weeks until she became stronger and bigger. The experts said they needed to wait for her heart to be placed inside her chest, and to be covered with her skin. Normal newborns have a space beside their left lungs so the heart can adequately fit. But in the first seven days – although Vanellope’s chest had opened a bit more – she couldn’t grow that same space. In the following week, her heart started to go down into her chest as a result of gravity. In the last surgery, doctors took skin from Vanellope’s arms and moved it into the middle of her body. She had no ribs or sternum, so doctors had to create a mesh to protect her heart. The baby girl stayed inside a ventilation machine because her organs still were moving until fit. “Cases such as Vanellope’s, where everything else appears essentially normal, are even rarer, and whilst it would seem more hopeful she will do well, it is therefore almost impossible to be confident of this,” said Branko Mimic, the lead surgeon at the East Midlands Congenital Heart Centre. – The Guardian reported. Five out of eight per million of babies might face this condition. From that total, just 10 percent might survive.